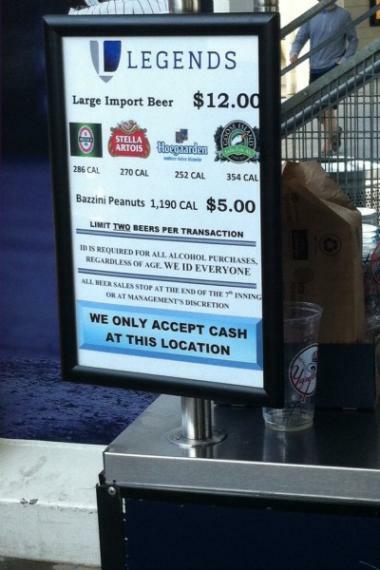 CONCOURSE — Yankee Stadium has hit another foul at the concession stands, charging thirsty ball fans $12 for an "import" beer that actually comes from Chicago. It's the second time in two months the Bombers have made a suds snafu. Last month, the stadium had to rename its "Craft Beer Destination" specialty alcohol booth when a fan pointed out that several drinks sold there did not meet the definitions either of craft or of beer. Now, the Yankees are hastily altering cart signs that hawk $12 “Large Import Beer” after DNAinfo New York pointed out that the menu included Goose Island — a domestic brew from the Windy City. Legends Hospitality, the company that operates the stadium’s concessions, said Wednesday that the company is in the process of switching out signs at its four "import" beer carts to more accurately reflect its offerings. Legends Hospitality spokesman Eric Gelfand said the new signs will read “Premium Beer” instead of “Import Beer,” since the carts sell Goose Island's India Pale Ale, a Chicago-based Anheuser-Busch brew that has never been brewed overseas. The carts also serve Beck’s, a brew originally made in Germany, which was recently bought by Anheuser-Busch and is now manufactured in the U.S. Their other Anheuser-Busch offerings, Stella Artois and Hoegaarden, are both imported from Belgium. Gelfand said the carts were intended to sell only imports, but that Goose Island IPA was a last-minute replacement for another Anheuser-Busch import that fell through. He said patrons were clamoring for a good IPA. “It’s a situation where, quite literally, the cart came before the horse,” Gelfand said. The flub wasn't lost on some of The Bronx's beer aficionados. Yankee Stadium was also caught red-faced during its home opener on April 1, when writer Amanda Rykoff noted that all the marked-up beverages sold at an artisanal-looking stand labeled “Craft Beer Destination” were actually MillerCoors products. The drinks — Blue Moon, Leinenkugel's Summer Shandy, Batch 19 and Crispin — are all mass-produced, so they don’t fit the official Brewers’ Association definition of “craft,” a chorus of online critics charged. In addition, Crispin, a cider, doesn't count as “beer,” they added. “Once again, the Yankees have figured out yet another way to charge a superior price for an inferior product,” Rykoff wrote on Tumblr.